Hello, I have the 'Supersound 8' 880 projector which is my dads from the early 80's. i cant even locate a manual to help me identify the part! The short lenght belt that connects the cogs on the side is broken and I'm trying to source this in the U.K so I can view and flim our old family videos. I have attached a few pictures that I have uploaded to my Google Drive account if any one can help! The tootheds are more rare, but often found. Hello Luigi, this eBay seller has already responded that this belt is not suitable for the part I require. The belt they are selling is for the actual Drive on the otherside of the projector! He doesnt even have a manual to help me source the part name. True, the seller is right. That part does not seem to need a belt, you only have to have that "motor" belt and for the two spindles. These three belts go all the way to the back of the projector, no front, it seems. The rest of the photos are on the good Van Eck site. You may REALLY need that tooth belt to drive the rest of the machine. Looking on the front,the motor seems to drive the upper pulley. Which will then drive the (corroded)rubber wheel on the main shaft (simply put,"Eumig"design). The pulley will swing back/forth for fwd/rev action,and will ride in/out for speed change. I believe that the needed belt should be some sort of "off the shelf" standard toothed belt as I'm now looking into a dot matrix printer sitting next to me,which uses some fine-pitch toothed belt to drive the print head. The pitch seems similar to that motor's belt. 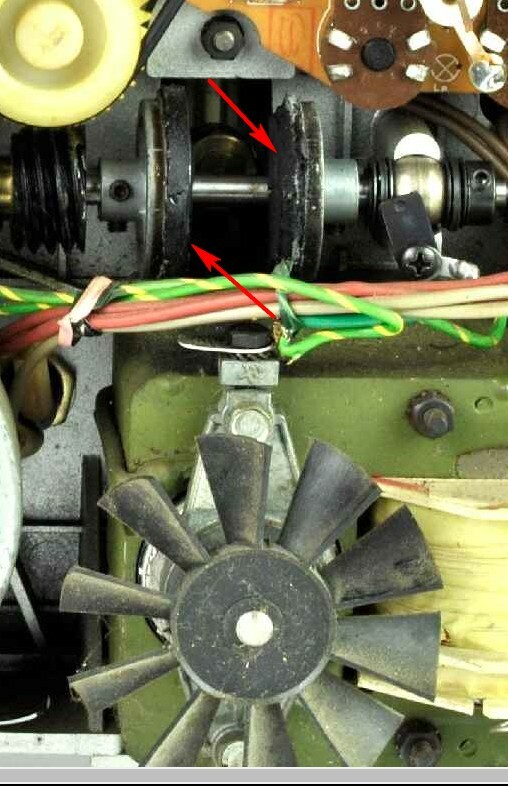 In extreme case,it might be necessary to replace both pulleys to use simpler round o-ring as the driving belt. The actual motor/drive pulley ratio wouldn't be so critical since it will drive that variable-ratio disc anyways. Firstly thank you for the replies and giving me some ideas. I might try and work out the circumference then dividing that figure by Pi with give me the inside diameter to possible drive it. Obviously it will require a V/toothed belt. True, even if I didn't understand the function of the belt. I'm intrigued! But... that seller on ebay sells toothed type, those 3 behind are not toothed, why he says it's not for that specific use? Neither that motor and for the arms belts seem to originally toothed. If you would like me to post more photos of this Projector let me know? Mich, I took photos also from the Van Eck site, I didn't know this projector, I discovered thanks to you that it is Italian. I am curious to know news from those who know more, especially the function of the front belt. Luigi and all, I hope you all had a great weekend! So I decided to open the back panel and take some more photo trying to help give me some more clues. Manufactured on 11th Jan 1978. I have added more photos to my Google Drive account with the internals. Belt lenght is approx 207mm/4mm width so now trying to source. That the belt only used to change the speed from 18fps to 24fps? I had found an image of similar model of same brand (IMAC), a Sonix 8, with similar technologies. See the photos and the front belt, It did not seem to me toothed. has spare parts for Supersound 8, maybe not the right belt but could help with some advice, such as the measurement of the aforementioned belt, so you can try a generic. I'm afraid that not only you'll need the toothed belt,but something had to be done with that corroded rubber flanged drive wheels too. That seems quite a mess there. 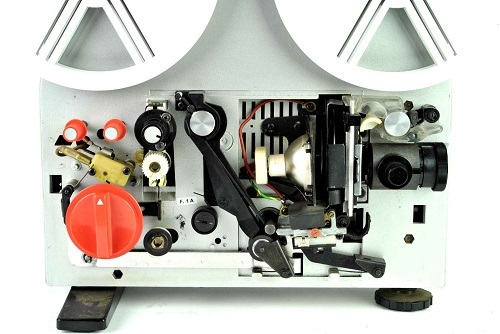 The Sonix 8s Super 8 Projector by iMAC is identical. However another Projector I cant find a manual for. @Nantawat I realise this however my goal is to get my dads old Projector working for sentimental value and as a avid technologist I feel like this is a mini-project. Mich, Imac was a fairly well known brand in Italy, I did not know this model, but I remember that it made standard and even toy-like projectors for the little ones. 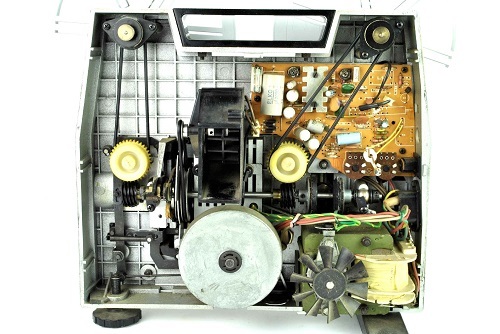 Try asking that Italian seller on ebay if he has a scan of your projector's manual or similar model.